Military Intelligence and the Arab Revolt examines the use and exploitation of intelligence in formulating Britain’s strategy for the Arab Revolt during the First World War. It also presents a radical re-examination of the achievements of T.E. Lawrence (Lawrence of Arabia) as an intelligence officer and guerrilla leader. Modern intelligence techniques such as Sigint, Imint and Humint were incorporated into strategic planning with greater expertise and consistency in Arabia than in any other theatre during the war, and their deployment as tactical support for the Arab forces was decisive. Using much previously unpublished material, this study shows conclusively how Britain’s intelligence community in Arabia influenced the conduct of the Arab campaign, promoted a full-scale guerrilla war and thereby facilitated the Arab armies’ march north into Syria, Palestine and the modern Middle East. 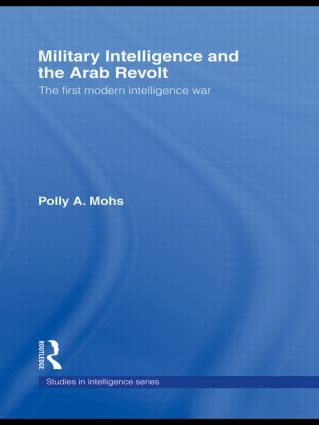 Polly A. Mohs contributes to the unveiling of another hidden corner of the history of the Middle East and to a better understanding of the significance of intelligence in formulating strategic processes in the modern era. Military Intelligence and the Arab Revolt will be of much interest to students of intelligence studies, military history, Middle East history, British imperial history, guerrilla warfare and insurgency. Polly A. Mohs is an historian and holds a Phd from the University of Cambridge.